We just got this press release in from the Inglot press office regarding their store opening in City Square. Waterford we are coming for you!! 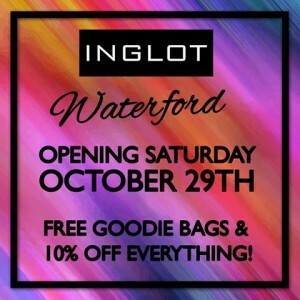 Inglot Addicts, we are set to open our 14th Inglot store this Saturday the 29th in Waterford. Our fabulous new store will be opening in the Arundel mall, City square Shopping Centre, Waterford- and our official launch party will take place on Saturday October 29th at 11am! For more information on all things Inglot be sure to like our Inglot Facebook page, follow our Instagram: inglotireland, Snapchat: inglotireland, and follow our Brand Manager Jane on Snapchat: janeinglot for a behind the scenes look at our setup! Come in and meet our team of professional makeup artists who will attend to all your beauty needs – offering exceptional service and guidance through our extensive Inglot collection & freedom system! For further information check out our social sites! We look forward to seeing all you Inglot addicts in store!